For a while the BFI’s Flipside release of Symptoms kept catching my eye. Nothing too unusual there, I seem to have been following the releases since way back when the series started and usually check in every now and again to see what subterranean / mondo / forgotten / exotica / odd b-movie / occasional slight strand of otherly pastoralism they’ve given a good old brush and scrub up to. Aside from that usual level of interest, something kept nagging away quietly at the back of my mind about Symptoms, although I think that I knew nothing or very, very little about the film, its plot, history etc. Then I came across a review wherein it was described as “…gothic-bucolic…” and “…the sort of thing that begat hauntology and Peter Strickland…”. This short piece ended “…it’s a revelation“. Well, that was me hooked. Actually, that was me hooked at the phrase gothic-bucolic, which seemed to strike a certain note and resonance with and well, just intrigued me. As a quick precis of the film’s history and story it was made in 1973, came out in 1974, received a fair amount of critical attention / praise and then largely disappeared for the best part of forty years. It is the tale of two young women who go for a break in a large countryside located house, wherein one of their mental states begins to splinter and fracture. I don’t seem to remember Peter Strickland mentioning the film in any interviews, nor listing it as one of the films that fed into / influenced / were an inspiration for The Duke Of Burgundy but the first time I watched it, in many ways Symptoms very much reminded me of that film – to the point where I almost want to watch them side-by-side, in a split screen manner. It could almost be seen as a companion or sister piece to The Duke Of Burgundy, although one that is more overly troubled and troubling. Not so much a forerunner, more that somehow it has tumbled back (or should that be forward?) in time from that film. That sense of connection and even sisterhood is possibly increased by Angela Pleasance in Symptoms bearing some kind of physiognomic similarity to Chiara D’Anna in The Duke Of Burgundy. Both have a slightly unworldly, almost childlike air to them, although Angela Pleasance’s character is more otherworldly than just unwordly, as compared to Chiara D’Anna’s character’s slightly brattish pique; Ms Pleasance’s character feels nearer to The Woman Who Fell To Earth. The setting and setup is not all that dissimilar from The Duke Of Burgundy – two women living in a relatively isolated rurally set grand house that is decorated in a slightly faded, slightly aristocratic, gilt framed manner. The Duke Of Burgundy seems to exist more in its own self-contained, quietly fantastical world, one where any possible external world or infrastructure are not seen or acknowledged – indeed only a visiting creator of “esoteric” furniture and an academy for the study of insects and the occasional brief reference to a neighbour are ever made. Symptoms acknowledges the outside world – London and visitors from there are mentioned or indeed visit, the women visit the local village for supplies but their world still has the intensity of a couple alone, one which increasingly collapses and intensifies into itself; anything outside of the house and/or their relationship is seen as and indeed feels like an intrusion. However, there is a distinct difference to the two films and their general tone / atmosphere: despite its main characters sometimes troubles, The Duke Of Burgundy’s pastoral idyll seems richly honey toned – mellifluous is a word that comes to mind. It is a world that you may well want to step into and not mind spending time there. Symptoms is probably almost the exact opposite. Despite a certain entrancing beauty, this is most definitely a gothic bucolia. There is a calm here, row boating on leaf filled water and even Duke Of Burgundy-esque carefree bike rides but also some kind of almost unbearable build up of pressure and tension. 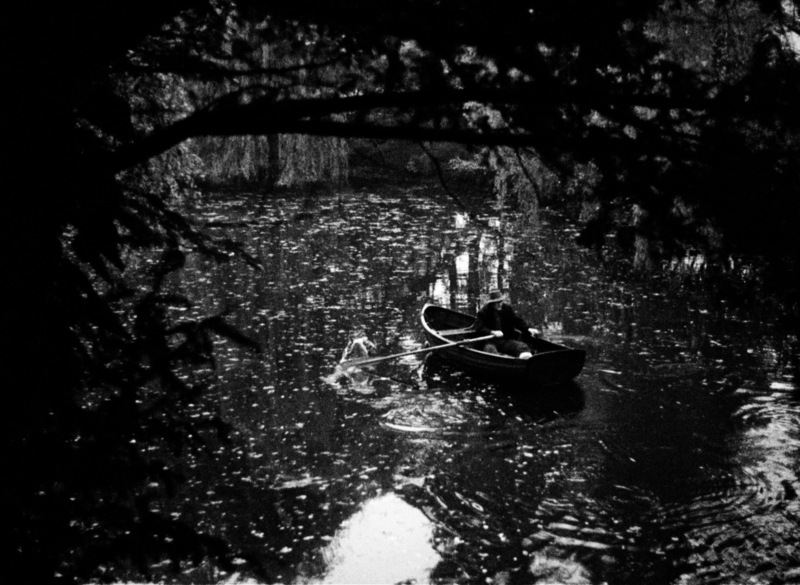 It has a subtly fractured dreamlike quality and although I can find myself relaxing, sinking into and enjoying Symptoms views of nature and escape, at the same time this is very much part of the film’s enclosed, self-contained, even possibly claustrophobic world, all overhanging branches and wooded enclosure rather than wide open spaces. At points light breaks through the trees but it seems to only just be breaking through, to be almost battling or momentary. 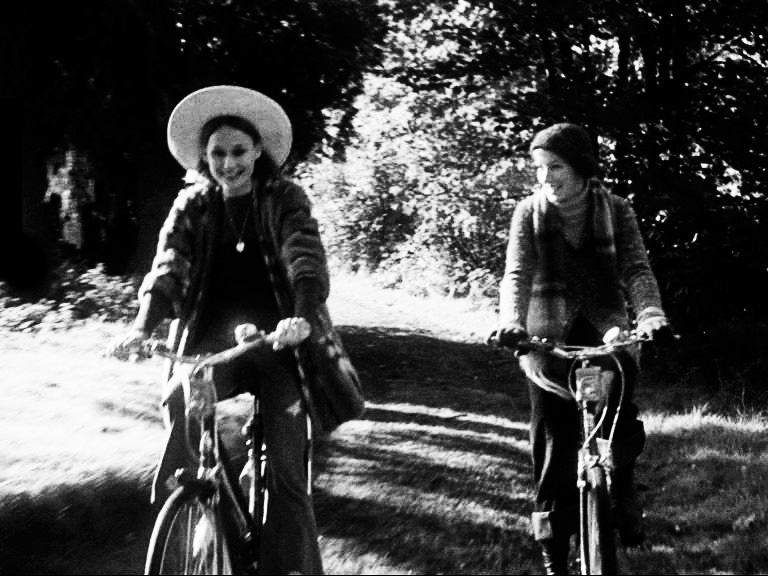 Apart from a few initial incongruous seeming Carnaby-Street-become-tourist-attraction, latter-period-hippie garments, it is a film that is difficult to quite place in a particular era and to a degree it seems to exist in its own time and space, almost a never never land separate from a particular decade. This is despite its muted, grey-green atmosphere that seems rather prevalent in film/television from the point of its making and which possibly reflects the fractured nature of the times and culture in which it was made. I can’t quite tell if this not being able to precisely pinpoint a decade is in part due to a certain sharpness, a certain glamour and style to the imagery that doesn’t quite seem to belong to the early 1970s and/or in part and interconnectedly due to the contemporary high definition restoration of the film. This is something I often seem to feel with high-end brush and scrub ups to films and other flickering tales from the past; a certain sense of dissociation with regards to the world I am watching, possibly due to the push and pull of the aesthetics of technological processes from different eras. That sense of dread: suffice to say that although not overly stuffed time-wise with such things, this is a film that does, well, not so much wander as lunge, spark and darkly shatter into intense, particularly unsettling physical violence. In a way, for myself, although in an inherent part of the film, this is when it is at its weakest – when it veers towards more obvious genre tropes and I think it is much more interesting when its (deeply) unsettled atmosphere is held at bay and its mystery is left intact rather than being given full unflinchingly brutish expression. Associated posters and promotion from when it was released seem to often have focused on those genre tropes but this isn’t really that kind of film. It is odder and more of its own than such standard exploitative fare. There is a layering, intelligence and unspokeness here, that seems to battle with and against its genre expectations. One that leaves me drawn to it and also slightly on edge just casting back to it – something it shares for myself with that other unsettling pastoral film work Kill List – although there the genre transgressive and visceralness is much closer to the surface. Symptoms has been sent forth into the world around this part of the world by the BFI and over the water by Mondo Macarbro. Trailers can be viewed here and here. Take a walk in the woods here. Other wanderings and sisterhood mesmerisations can be found around these parts here.